As many people know, many of today's bathrooms offer way more than just functionality. They're comfortable, stylish rooms that often reflect the homeowner's personality. With many people viewing their bathroom as a place to relax and unwind, consumers are taking extra care in the choice of one of the room's focal points - the bathroom vanity. According to Kitchen & Bath Design News (KBDN), two types of bathroom vanities are in high demand right now. Transitional styles with clean lines and easy-to-maintain tops are popular, as are vanities with furniture-like styling. Manufacturers surveyed by the publication say that many consumers are choosing simpler designs over more ornate ones. "The most desired vanity design is a clean, transitional, Shaker-style vanity with less detail, more defined lines and light colors to make a fresh, clean look," Angela O'Neill, director of marketing and advertising for Wellborn Cabinets, told KBDN. 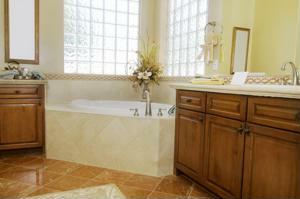 Furniture styling is also a popular trend among bathroom vanities, as they can often add a sense of elegance to a room. "We are seeing more people request stand-alone vanities that look more like furniture than the typical vanity cabinet," Jeff Ptacek, product manager for Fieldstone/StarMark Cabinetry told the trade publication. As for vanity tops, manufacturers tell KBDN that solid surfaces such as quartz and granite remain popular.